With Zimbra Collaboration Server, you are able to access your email using the Mozilla Thunderbird messaging and collaboration client. 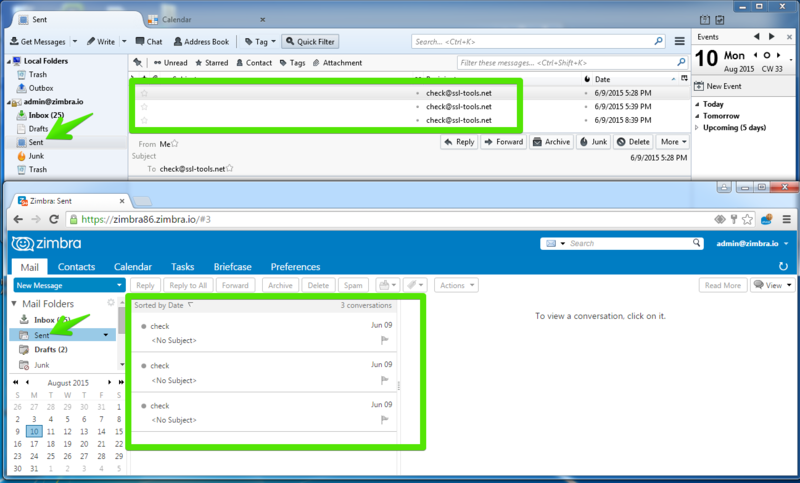 Optionally, you can view your Zimbra Calendar using the separate Lightning Add-on for Thunderbird. 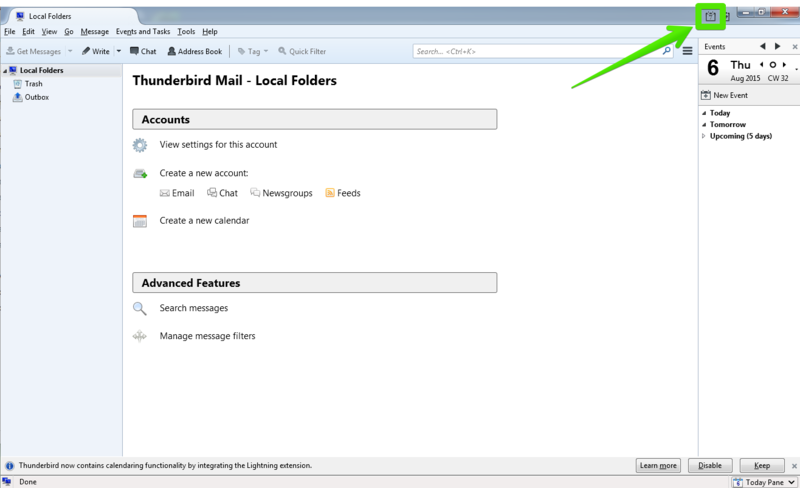 This guide shows you how to access to your Zimbra Mail and Calendar using Thunderbird 2 with the Lightning 0.5 Add-On. This guide assumes that you have already installed Thunderbird and, optionally, have already installed the Lightning Add-on. For more information on downloading and installing this software, go to Mozilla's Thunderbird page, http://www.mozilla.com/en-US/thunderbird/ . Your Zimbra email address and password. Incoming mail server. This is usually in the form of mail.domain.com. Outgoing mail server (SMTP). This is usually in the form of smtp.domain.com. Your system administrator will be able to give you this information if you do not already have it. 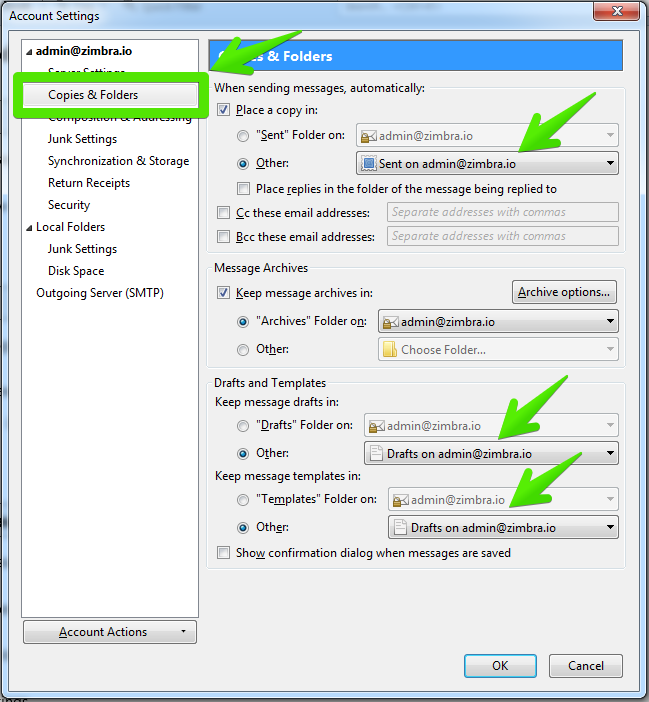 To access your Zimbra Mail, you must first create an account in Thunderbird. The following steps guide you through setting up a new account in Thunderbird. 1.- Go to File > New > Account. This will open the Account Wizard. If you have just opened Thunderbird for the first time, the Account Wizard will automatically open. Enter the name you want to appear in the From field of your outgoing emails in the Your Name field. Enter your Zimbra email address into the Email Address field. Click Next. 4.- Verify that the information displayed is correct. If any information is incorrect, update the information. When the account information is correct, click Done. Your settings are saved, and the Account Wizard closes. You are now able to access your Zimbra Mail. If your incoming server and outgoing server use not secure connections, you will need to configure this before you are able to access your mail. Additionally, if you did not specify an outgoing server when you were setting up your Zimbra email account, you will not be able to send outgoing messages yet. See the next section in order to change your server settings. If your incoming server and outgoing server doesn't use secure connections, you will need to configure this before you are able to access your mail. Additionally, if your Outgoing Server (SMTP) is not set to the correct server, you will not be able to send outgoing messages. Use the following directions to change your server settings. 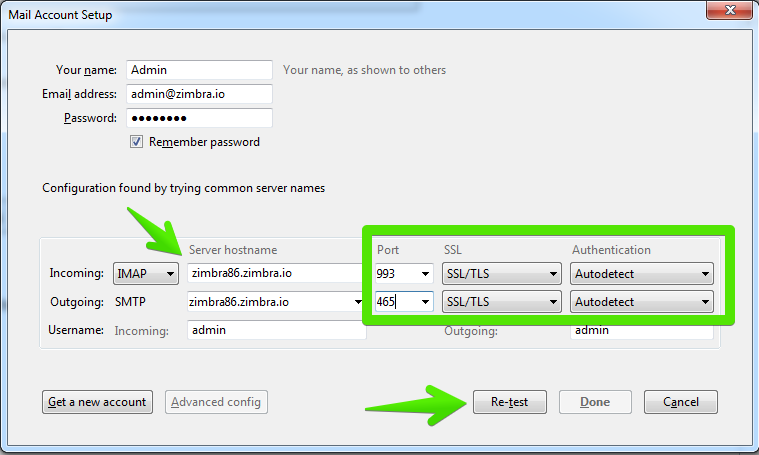 2.- Select Server Settings, which is located under your Zimbra email account profile, listed on the left. Your Server Settings are displayed. 3.- Under Security Settings, select whether to use TLS if available, TLS, or SSL. Select Never if you do not want to use a secure connection. Select whether to use secure authentication. 4.- Click OK to save your settings. 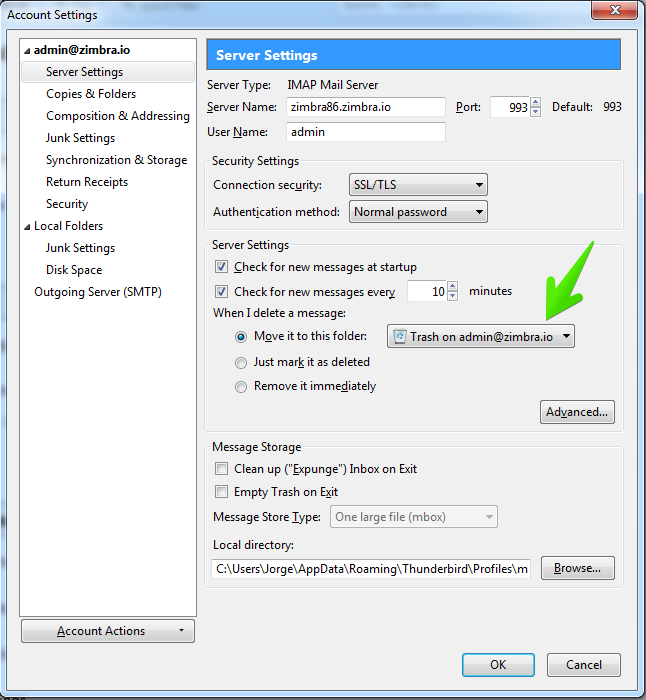 2.- Select Outgoing Server (SMTP), which is located at the bottom of the Settings list on the left. 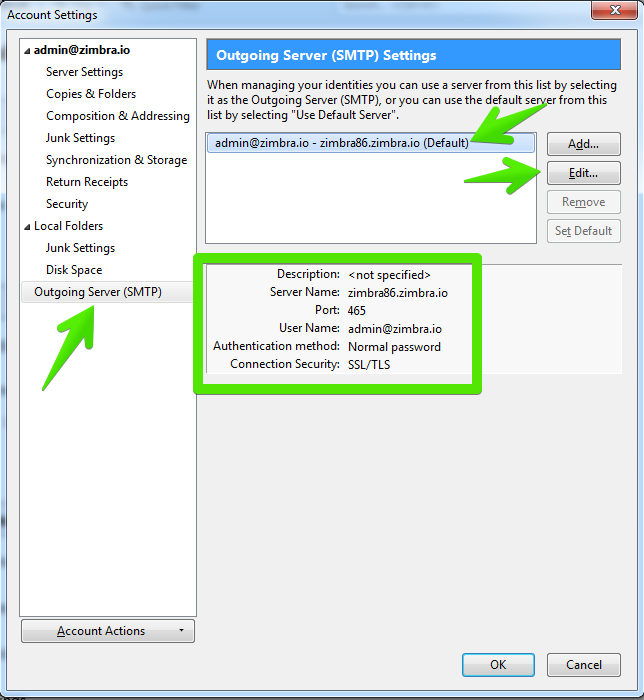 Your Outgoing Server (SMTP) Settings are displayed. 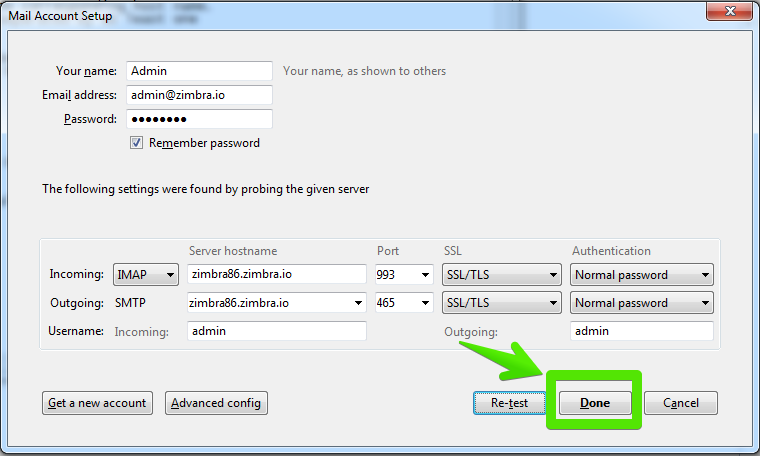 3.- Select the outgoing server for your Zimbra email account, and click Edit. 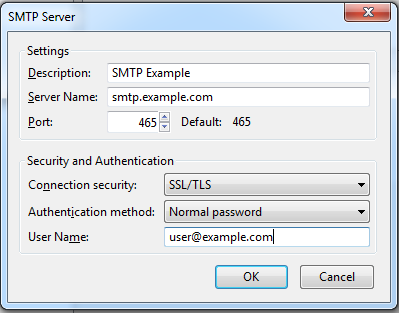 4.- In the SMTP Server dialog, under Security and Authentication, select whether to use TLS if available, TLS, or SSL. Select No if you do not want to use a secure connection. Click OK.
5.- Click OK to save your settings. 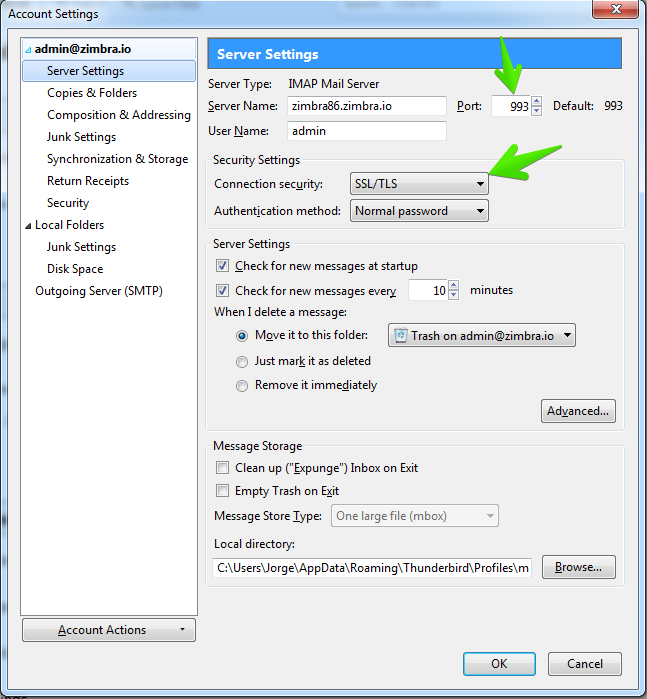 2.- Select Outgoing Server (SMTP), which is located at the bottom of the Settings list on the left. 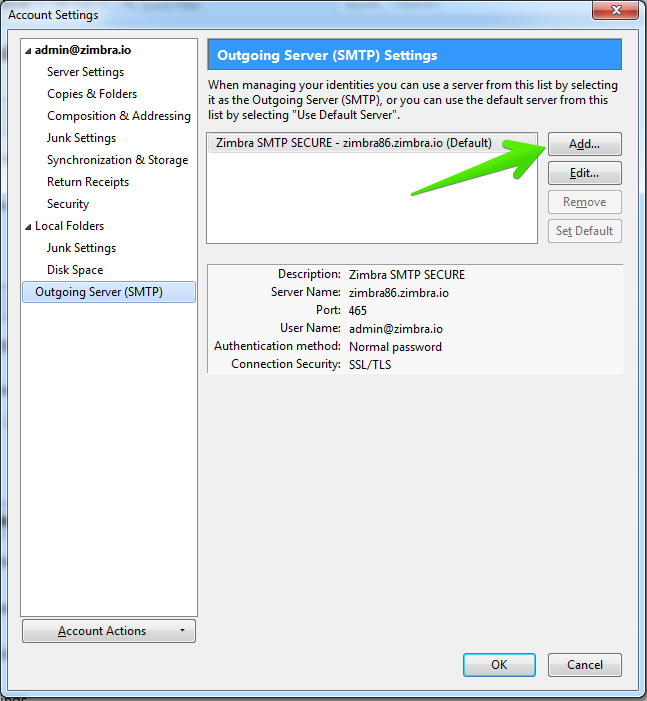 Your Outgoing Server (SMTP) Settings are displayed. 3.- Click Add. Description. Enter a name for your outgoing server. Port. This is 465 by default. If your SMTP server has a different port number, enter it here. Non secure connections needs to select port 25. User Name. 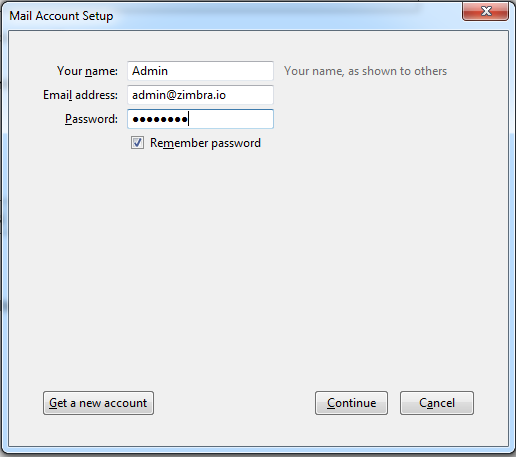 Enter your Zimbra email account user name. Secure Connection. Select whether to use TLS if available, TLS, or SSL. Select No if you do not want to use a secure connection. 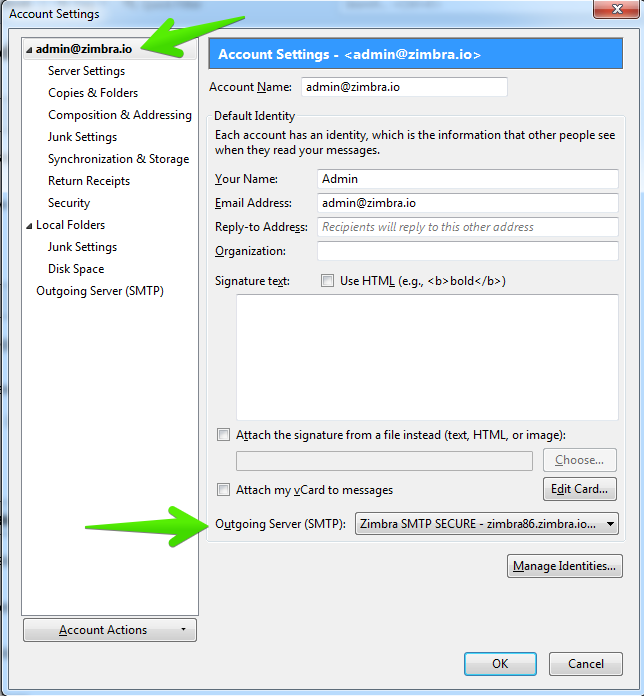 Click OK. 5.- In the Account Settings dialog, select your Zimbra email account, located in the Settings list on the left. 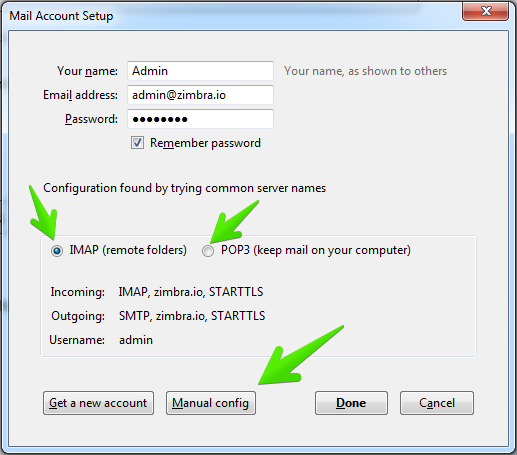 6.- Select the Zimbra outgoing server from the Outgoing Server (SMTP) drop-down list in your Account Settings. 2.- Subscribe to the proper Folders like Drafts, Junk, Sent and Trash. 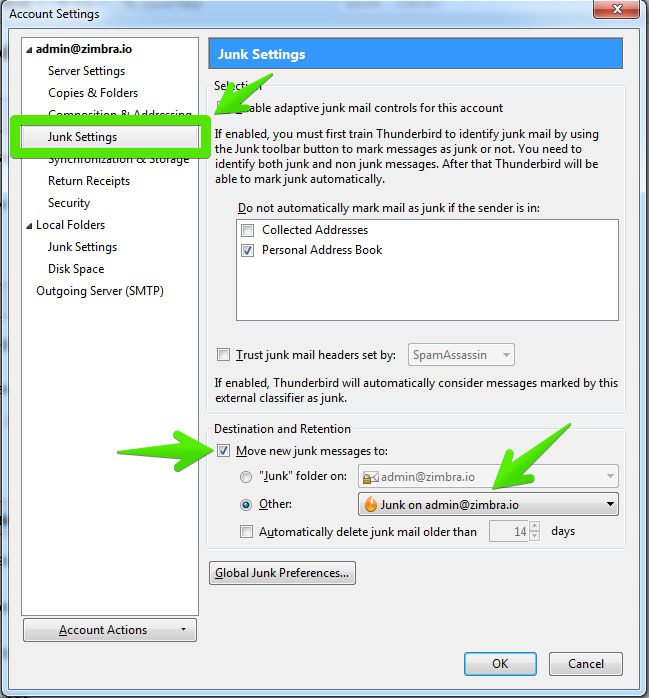 5.- Go now to Junk Settings, and activate the option to move the Junk messages into the folder localted in the IMAP account. 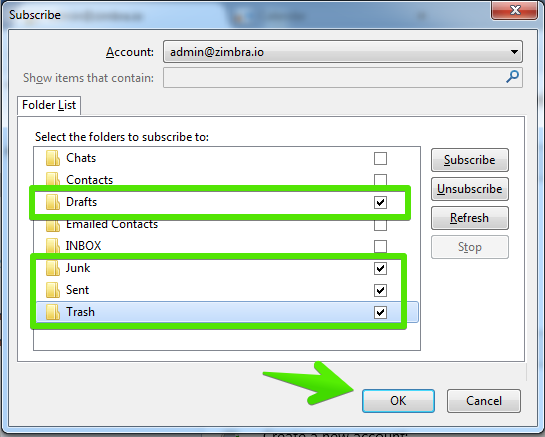 6.- Finally in Server Settings, set your Trash Folder to point into your IMAP Trash folder. 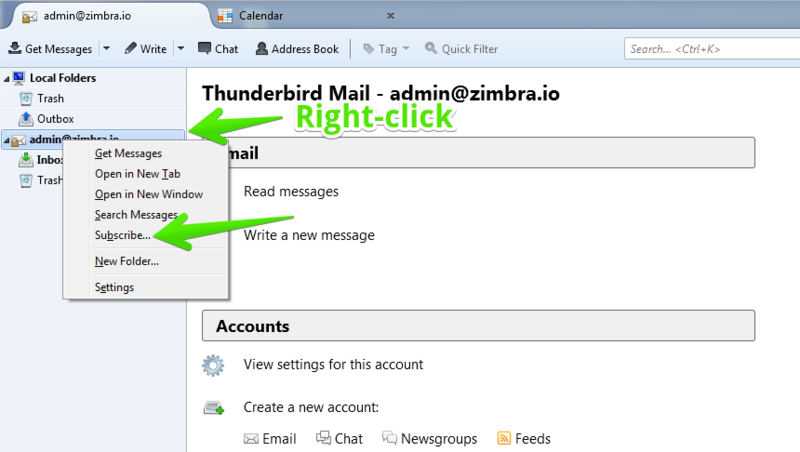 The following steps show you how to read your Zimbra Calendar with Thunderbird using the Lightning Add-on. These instructions assume that you have already installed Lightning 0.5 at least, Thunderbird comes with Lightning since the version 38. You can also add your credentials into the URL. Note that this includes your password, which may not be recommended. 1. Click on the Calendars tab, in the top left of your Thunderbird application. 2. Click right-click New. 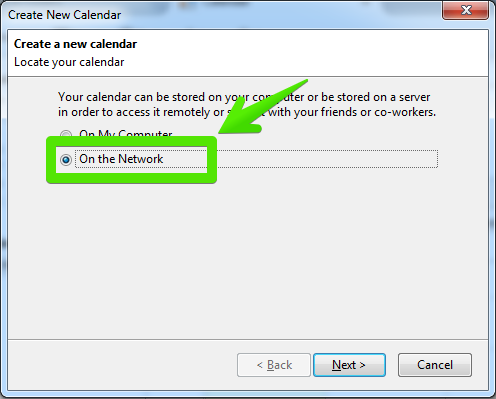 A Create New Calendar dialog will display. 3. Select On the Network. Click Next. 4. Select CalDAV. In the Location field, enter the URL of your Zimbra Calendar, and click Next. 5. Enter a name for your Zimbra Calendar in the Name field. Select a color for your Calendar, and click Next. 6. Enter your username and password, if prompted. 7. You will be able to see all the Appointments in your Zimbra Web Client, and you will be able to edit them, delete them, etc. Then, write the name for the Tasks List, in this case Technician Bob, you will need later the %20 in the URL, if you can, it's much better to use - or _ instead space. In the email field, select the Bob's emails address, and select the role you want for Bob, read-only or read-write. 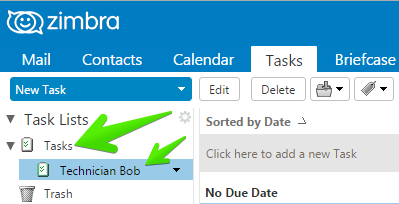 Now, you can tell to Bob the URL that he must use to connect to the shared resources, Calendar, Tasks, etc. 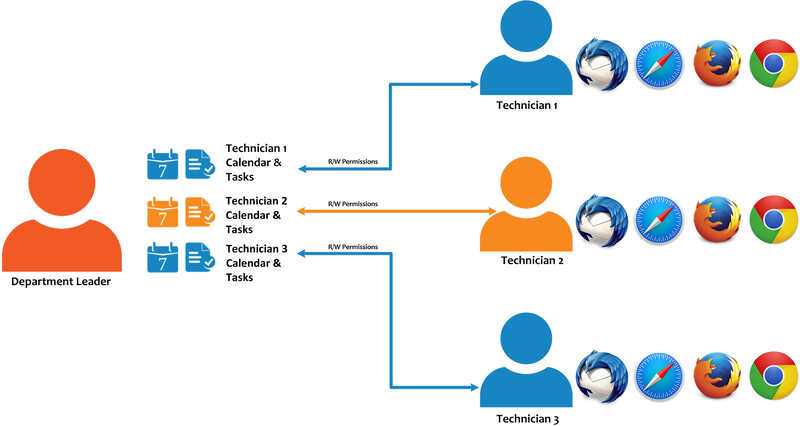 The URL will be the Responsible one, like https://zimbra.example.com/dav/RESPONSABLEUSERNAME/Tasks/Technician%20Bob even if the URL points to the Responsible, because Bob has access to that concrete resource, Bob just need to write his credentials when Thunderbird asks about them. 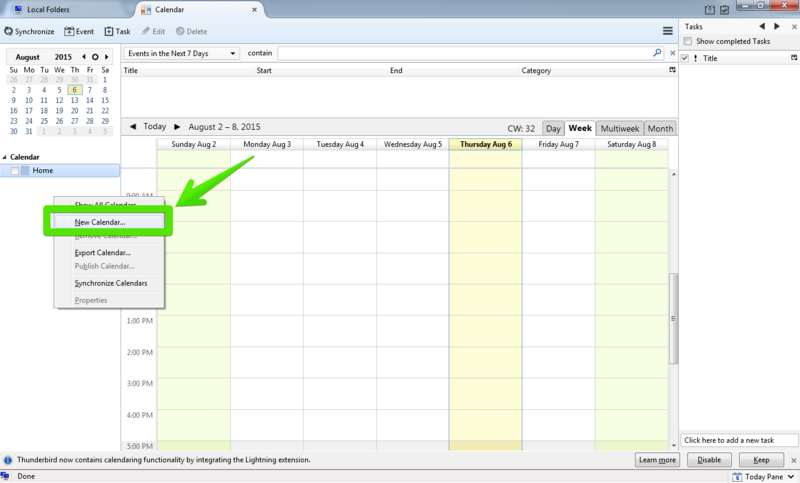 Note: These instructions will allow you to view your calendar using Thunderbird with the Lightning Add-on. You will not be able to create or edit appointments, meetings, or events. 1. 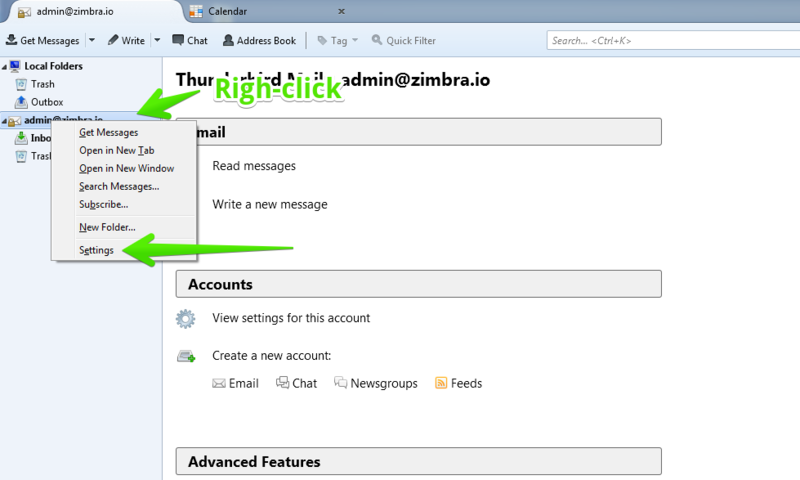 Open the Zimbra Web Client, and click the Calendar tab. 2. 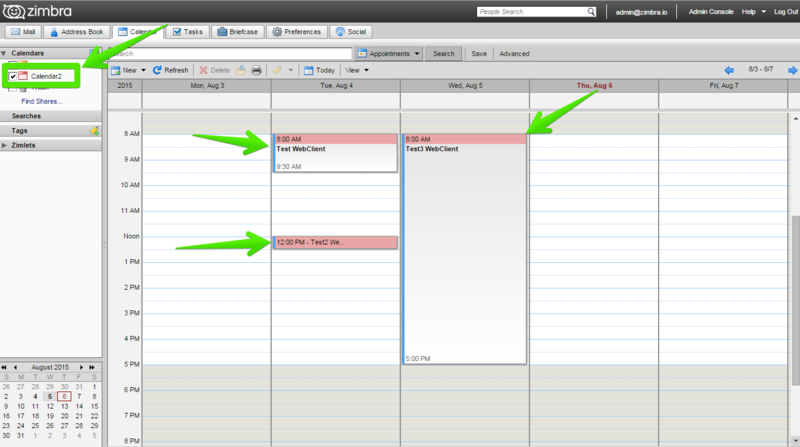 Right click Calendar in the Calendar List pane, and select Share Calendar from the right-click menu. 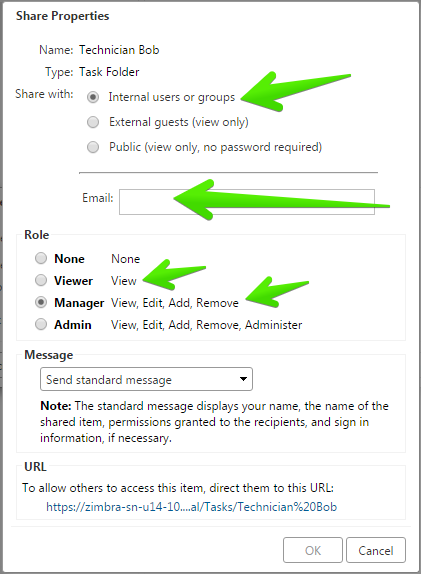 The URL of your Calendar is located at the bottom of the Share Properties dialog. Write down or copy this URL. 4. Click the Calendars tab in the lower left of your Thunderbird application. 5. Click New. A Create New Calendar dialog will display. 6. Select On the Network. Click Next. 7. Select iCalendar (ICS). 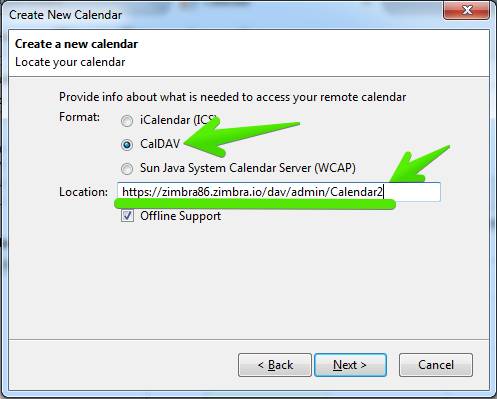 In the Location field, enter the URL of your Zimbra Calendar. Click Next. 8. 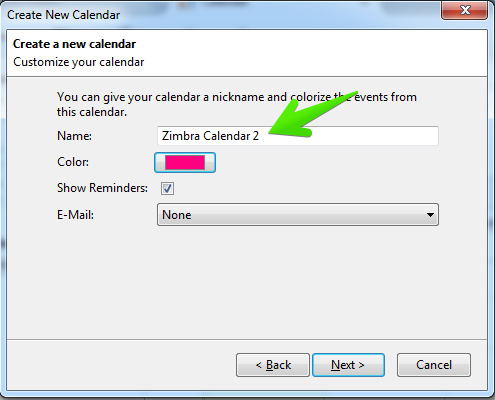 Enter a name for your Zimbra Calendar in the Name field. Then, select a color for your Calendar. Click Next. 9. Enter your username and password, if prompted. If you have used the Zimbra Web Client, note that the following features are different when using Thunderbird as a client. To view mail folders that you have created using the Zimbra Web Client, you must subscribe to them. Thunderbird may not always expunge deleted items or old drafts. 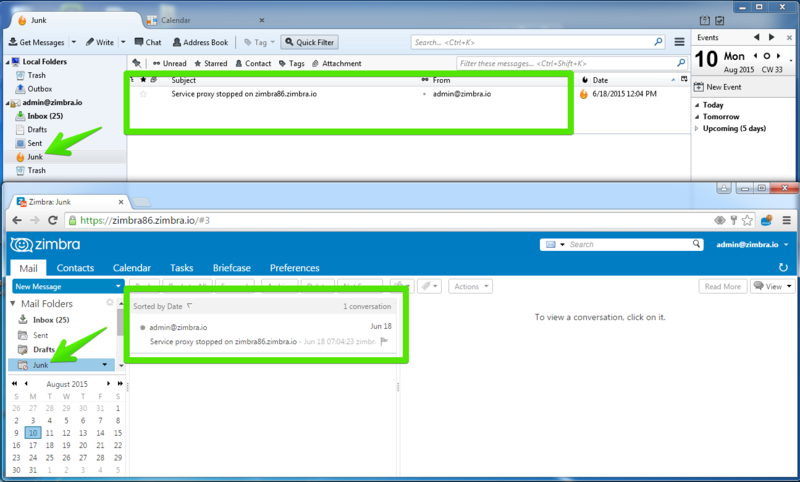 These messages will be visible if you access your mail using Zimbra Web Client. Lightning does not use notifications for upcoming events and meetings. 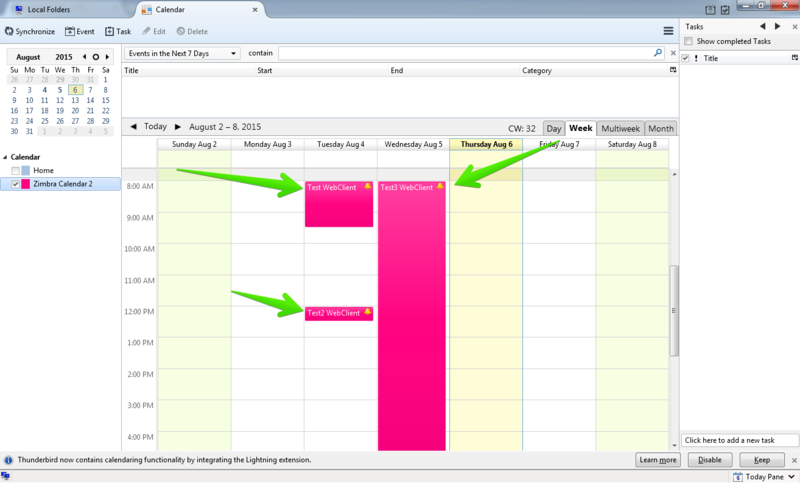 The Lightning Add-On may not automatically refresh your Zimbra Calendar. 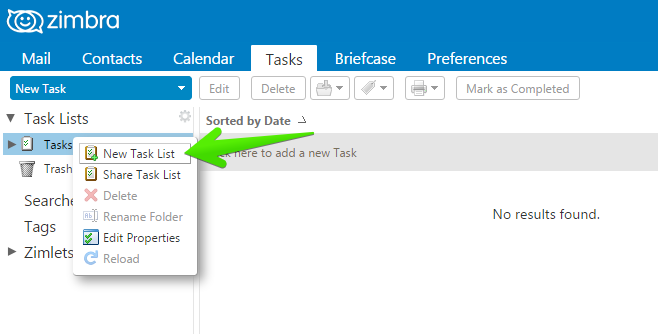 To see the most recent version of your Calendar, right-click and select Reload Remote Calendars . Lightning only records a single set of authentication information for all remote calendars. If you have already set up access to another remote calendar using Lightning, you may encounter authentication errors when attempting to view your Zimbra calendar. 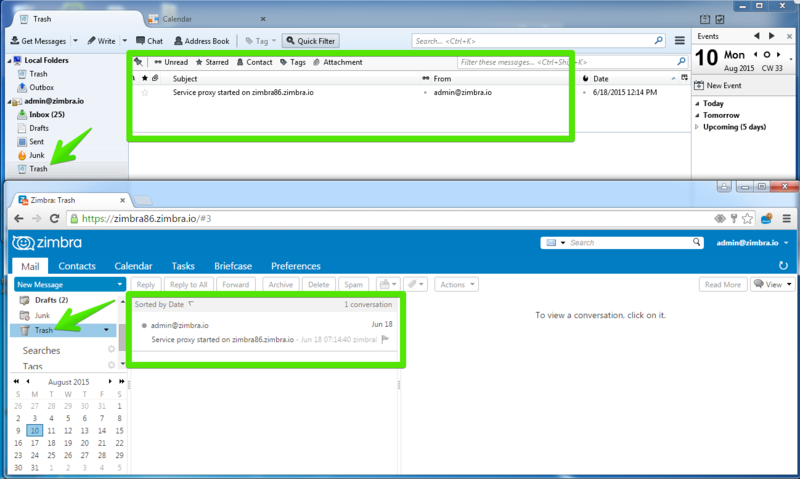 A recent add-on available on the Thunderbird market allow your desktop client to connect to the DAV API of Zimbra and synchronize all the contacts. First of all you need to download the extention on the market and follow the how to provided in order to activate and present the cardbood extention. One done, click on "add addressbook". You will start the wizard. In it the first window select the "on the network" option and then "next"
You will need to validate the setting in order to finish the installation. We have now our contacts synchronized with Thunderbird.